Our 72" x 24" Organic Portable Bedrolls will have approximately 3-4 inches of loft when brand new and will compress somewhat with use. Each Organic Portable Bedroll also comes with a machine-washable and dryer safe 100% organic cotton removable cover. To select your Organic Portable Bedroll Fill and Cover Color choices, simply click on the Add to Cart button below and then choose your fill and cover options from the drop-down menus provided on the shopping cart page. ** Just click on the Add to Cart button below and make your fill choice from the drop-down menu presented. Each Organic Portable Bedroll includes a machine washable and dryer safe 100% organic cotton removable cover to protect your bedroll investment. These durable and styles covers are made from heavy 9 oz. organic cotton fabric. The covers also come with ties on the end to help secure your rolled bedroll when you're ready to pack it up for the day. 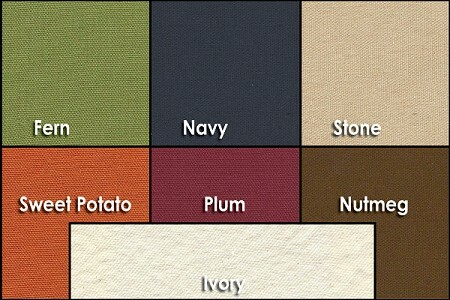 Colors include Fern, Navy, Stone, Sweet Potato, Plum, Nutmeg and Ivory. Please note that the Ivory color is simply the un-dyed natural cotton fabric. Also, please note that colors shown are approximate representations. The colors you see on your screen are not exact as each screen displays colors differently. To order, simply click on the Add to Cart button on the Organic Portable Bedroll below and then choose your zippered cover option from the drop-down menu provided on the shopping cart page. Please note that our Organic Portable Bedrolls are not intended for use as permanent sleeping surfaces. They are designed for a quick (on-the-fly) place to to nap or hang-out. For a more permanent sleeping surface, please see our Organic Futons. Please allow approximately 2 to 4 weeks for delivery.